This Clovis preform was found several years ago by a road maintenance crew member somewhere in the St. Louis by-state area. A large wide flute was struck from one side but there is no indication that any further attempt was made to flute the other side or finish the point any further. The striking platform remnant on the basal edge has not been altered. 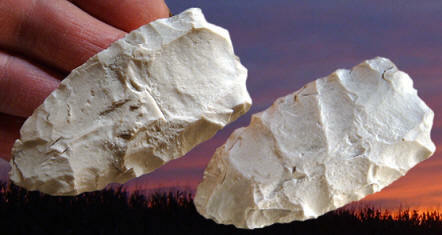 This preform is made of white Burlington chert. It measures 2 13/16inches (7.1 cm) long and 1 3/8 inches (3.5 cm) wide.